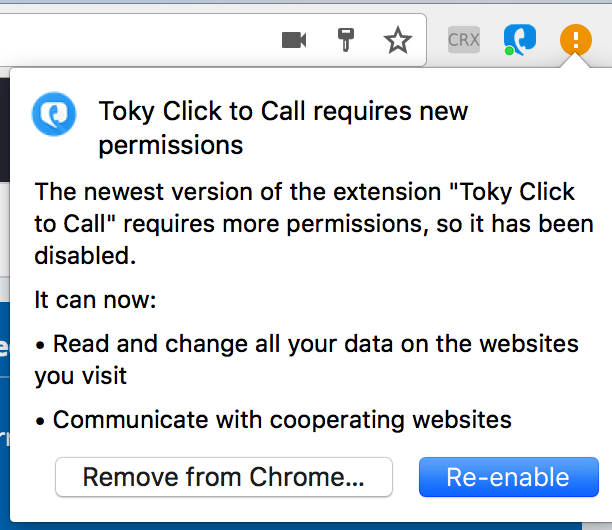 The click to call extension gets regularly updated and, sometimes, we add new CRMs and functionalities to it that may require new permissions. Every time the extension gets a new integration, you will need to re-enable it to have it back because Google Chrome will require you to re-agree to the old and new permissions required. If the extension suddenly stopped working, please make sure you have it installed, and with the new permissions accepted. If you can't see this option, please visit the Chrome Extensions (chrome://extensions) page to re-enabled it.